You'll be £14.99 closer to your next £10.00 credit when you purchase History of Men's Fashion. What's this? Everything you ever wanted to know about men's clothing – and so much more - from the exact hour Nelson lost his right eye to the type of palm needed for a Panama hat, what Cary Grant's tailor had to do to his shoulders - and those all-important questions of what to where, when and why, including when to wear a bow tie (surely 'never' is the only answer?). A quirky book full of facts that you never realised you needed to know, including the exact thickness of animal hair used to create must-have fashion items, including suits. Provocative, and controversial at times – but always very well dressed. A quirky book full of facts that you never realised you needed to know, including the exact thickness of animal hair used to create must-have fashion items, including suits. Provocative, and controversial at times - but always very well dressed. Nicholas Storey's book doesn't wallow in men's fashion from the point of view of spending as much as you can on something in order to make your chums envious – rather, it pokes gentle fun at men's fashions through the last two centuries, and comes up with a whole load of interesting facts such as you might find in a special edition of QI on what men should be wearing. This is popular history at its very best, amusing, entertaining, enlightening, and very, very funny. Maybe he didn't intend it to be funny.. and that's why I'm entirely the wrong person to be writing this review... It's a brilliant book! In this quirky guide to what the well-dressed man is wearing, barrister Nocholas Storey rummages through the history of men's fashion and explores what to wear, where to purchase it, and where to be seen wearing it. Quizzing some of our best known men's fitters, he discovers what suits men and why, as well as revealing some of the history's worst fashion errors. Tailored to fit anyone interested in the history of men's fashion, this is a must-read book, not just for its wealth of information but for the fascinating facts which is what makes this book such an informative and humorous read. No well-dressed men should be seen without it. 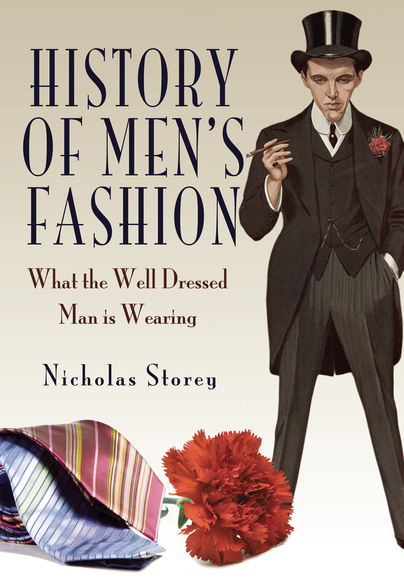 A must-read book of quirky information and interesting facts about the history of men’s fashion: exploring what best-suits and why and, contrariwise, revealing some of the worst fashion no-nos throughout the past. With expert advice from some of our most excellent male fitters, Storey’s guide to what the well-dressed are wearing is an intriguing and amusing book, which no man should be without! The section on Necessary Accessories is typical. In one long paragraph Mr. Storey provides very useful advice on miscellaneous jewelry (after beginning by stating that he will not), not only on cufflinks but also pins for formal day wear and collar studs for shirts with detachable collars. Eccentric, perhaps, by contemporary standards but to my knowledge there has been nothing like History of Men's Fashion published in the past fifty years. Nicholas Storey charts a quirky way through male fashion in an amusing and witty investigation. In the 19th century, rich English women who ordered the latest dresses from Paris centuriers would incarcerate the garments when they arrived in a trunk and leave them there for a few seasons so that, when finally worn, they didn't appear fast or showy. Earlier, 18th century George 'Beau' Brummell was commended for the perfect propriety of his dress rather than for its notoriety. He was, as Nicholas Story puts it: 'A dandy, NOT a Popinjay'. In England, it has never been considered good form to be garish either in country or town. But that does not mean being sloppily dressed: quite the reverse, as Mr Storey amply illustrates. Today, any ambition for sober correctness has gone out the window with women's fashion. However, it lingers in traditional male dress. Mr Storey, a barrister, offers a compendium of correct garments for all occasions, plus the best places to bespeak them, as well as anecdotes from films, books, royalty and the beau monde. He writes from the heart, but with the barristerial pith and attention to detail and terminology, a packing a lot in. He includes useful contact list for suppliers in the 'magic quadrangle' of Savile Row, Regent Street, Bond Street, St James's, Pall mall - 'God's quad'. Mr Storey's maintenance tips, from washing chamois gloves in Lux flakes when being worn to using white vinegar to spruce a Panama hat are excellent. He is crisp on the no-brown-in-town rule for shoes and suits, and offers indispensible notes on country clothing, from the appropriateness of a Tattersall waistcoat from Cordings to describing a New-market book (a delightful affair with a long canvas upper). He solves every quandary, from proper 'full-fig' (white tie) to the right (grey) topper for Ascot, to where to get and wear tweed. It is all here. Hats off. "Ever since the French Revolution, the well dressed man has striven to emulate the ideal of the well dressed English gentleman...when you get the authentic English perspective written by an Englishman, it is cause for celebration." Leaders of fashion all share one thing in common: a discerning penchant for the English sartorial standard. This book covers all the main areas rather well, just how Beau Brummell would have specified. "...it is excellent....unlike any author in the last twenty years, NJS nails down the essence of British style in a very entertaining way. He also defends our cultural treasure...in a bold and manly manner that is worth the price of the book itself...It is a style that is likely going to make the many good lessons contained in the 'History of Men's Fashion' palatable and accessible for readers." Now and again, well-dressed men do well to apply the brakes to the runaway train of fashion. Anyone aiming for timeless elegance, rather than temporary chic, will benefit from Storey's authoritative, but readable book. Not only does he go through the origins and correct form of classic clothing, he also has useful lists of stockists and invaluable maintenance advice.